Start Reselling Ear Plugs Today - Painlessly. 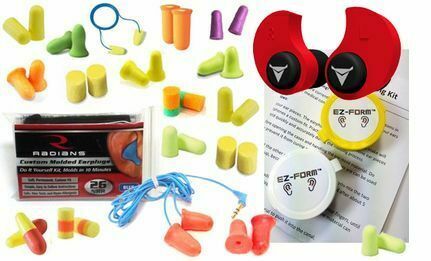 The Ear Plug Superstore Reseller Starter Pack is the perfect way to start offering a selection of our most popular ear plugs for sale with minimal risk. Get our best pricing - normally only available on bigger bulk purchases - and find out which earplugs work best for your business and your customers. Each Just the Largest trial pack contains eight pairs of our largest foam ear plugs. Foam ear plugs are simple, inexpensive, and highly effective at blocking noise. These larger-sized foam plugs are ideal for everything from industrial work to sleeping. The ear plugs in this sample pack have been chosen specifically to fit those with larger ear canals. Each Just the Smallest trial pack contains eight pairs of our smallest foam ear plugs. Foam ear plugs are simple, inexpensive, and highly effective at blocking noise. These smaller-sized ear plugs are ideal for everything from working to sleeping, and many find these to be perfect for getting relief from snoring. Chosen for those with smaller ear canals. Radians DIY Custom Ear Plugs are custom-molded ear plugs that you make yourself at home. Everything your customers need is included in each package, including the putty materials to mix together to form the plugs. Our customers have used these successfully for a huge variety of applications, including sleeping, motorcycle riding, and shooting. One of our most popular items, this is an affordable custom ear plug that consumers from many walks of life will love. Includes a dozen pairs in 3 assorted colors. Decibullz DIY Custom Ear Plugs are the only custom-fitted ear plugs you can make with nothing but the ear plugs and a little hot water. These are easily re-moldable until you get a perfect fit, a feature completely unique to Decibullz plugs. These are the most expensive of the DIY custom ear plugs included here, but they are an extremely desirable choice for anyone who needs to avoid the traditional putty materials used in other DIY custom plugs. Includes one pair red and one pair blue. EzForm DIY Custom Earpiece Molds for Earphones expand on the concept of the DIY custom plug to allow customers to create their own custom molded earpieces for their in-ear earphones. Far more comfortable than standard foam or silicone ear tips, custom tips fit securely and won't fall out. The process is similar to the process of crafting custom DIY ear plugs, though a bit more complicated as the tips have to be molded around the earphones; comes with instructions. Includes 2 pairs beige and 2 pairs black. Plugfones Workers Isolation Earphones are actually an earplug/earbud hybrid, combining music listening with dependable protection from hazardous sound. A dream come true for industrial workers who spend time in high-noise environments, these are one of our top sellers. The ability to listen to music on the job is a powerful benefit you can offer to customers across a wide range of occupations and industries. Includes two pairs of earplug-earbud hybrids. This broad selection of items has been chosen from our most popular, customer-pleasing products, with enough variety to cover a wealth of different hearing protection applications. Help your business stand out from the crowd with unique products your customers actually need - and won't find in most other stores. All of the included custom ear plugs are do-it-yourself ear plugs your customers can easily make by themselves (or with a little help from a friend). An alternative to expensive professional lab-made custom ear plugs, which require ear impressions and weeks waiting for the mail to run, these DIY custom plugs are affordable and effective. They're also hard to find in brick-and-mortar stores - and customers rave about them. The foam ear plug assortment packs are an Ear Plug Superstore original, found nowhere else. And the Plugfones are also a unique and hard-to-find item with broad appeal. People love the ability to listen to their music while they wear hearing protection, and that's exactly what Plugfones deliver. With $305.02 worth of products for just $236.41, the Reseller Starter Pack is a previously-unprecedented opportunity to take advantage of our very best pricing without buying in big quantities. You can just keep shallow stock of each item while you test the market, so you never get stuck with a ton of inventory that doesn't work for your store. These heavily discounted prices are normally only available on larger bulk orders, but we put this Reseller Starter Pack together especially to help retailers who are interested in making high-quality hearing protection products available to their customers for the first time. Ear plugs are wonderful products that solve real problems and meet real needs for customers. Ear plugs perfectly compliment all kinds of businesses - from motorcycle apparel boutiques to pool supply stores, from shooting ranges to music shops - and all of them help customers to stay safer, healthier, and happier. Earplugs are an ideal add-on product for so many niches! And they're something people really need, so these are products you can really feel good about selling. Low Risk - Get Started Now! A small investment with a big payoff, the Reseller Starter Pack helps to significantly reduce the risk of taking the plunge and beginning to resell our most popular products. By starting here, you can learn what works - and later, you can return to buy the specific products that work best for your customers in larger quantities, so you can continue to take advantage of our best pricing. There's little to lose, and a lot to gain. Start right now, and you can grow your ear plug sales at the speed that's just right for you and your business. Need more details? Have more questions? Contact us today, and we'll be happy to help you with all the information you need to get started right away! Call us at (918) 478-5500 during business hours (central US time) or contact us any time via email: - we are here to help. What are you waiting for? Foam Ear Plug Trial Kit: Just the Largest is designed to help those who need a larger than average ear plug to find one that works best. We have chosen from more than 50 different foam ear plugs, those with the ability to fit people with larger ear canals. If you usually find the plugs you try to be too small, this trial pack is exactly what you need. Foam Ear Plug Trial Pack: Just the Smallest is designed to help those who need a smaller than average ear plug to find one that works best. We have chosen from more than 50 different foam ear plugs, those with the ability to fit people with smaller ear canals. If you usually find the plugs you try to be too big, this trial pack is exactly what you need. Got Ears?® EZ Form™ DIY Earphone Mold Making Kit lets you quickly, easily and safely make your own custom fitting earphone molds right at home, and at a great price. No more earpieces falling out, or tinny sound due to poorly fitting replacement tips, and you will not believe how comfortable a set of earphones can feel until you try them with custom fitting earphone molds made for you, personally. Got Ears?® Plugfones Workers Isolation Earphones are designed specifically to be used to safely listen to music in noisy workplaces.